This was quite a busy week, – it was a great one, but busy nonetheless. I sing in two different bands (bet you didn’t know that about me =)) and this week we were booked to entertain at a party with approx. 150 guests. So a lot of rehearsing was in its place and fortunately everything went well. It never ceases to amaze me how giving it is to give a concert, but man, was I busted afterwards. I had a busy week at work as well. Work is pouring in, and while it’s very satisfying and I love my job, my head is tired when I get back in the evenings. Good thing I had nothing planned this weekend so I could simply relax and putter about doing nothing really. I cooked some good stuff, but that’s basically all that has happened. BF brought home a huge steak, that we grilled and had with fries and sauce Bearnaise. Then I experimented with making these breakfast cups. 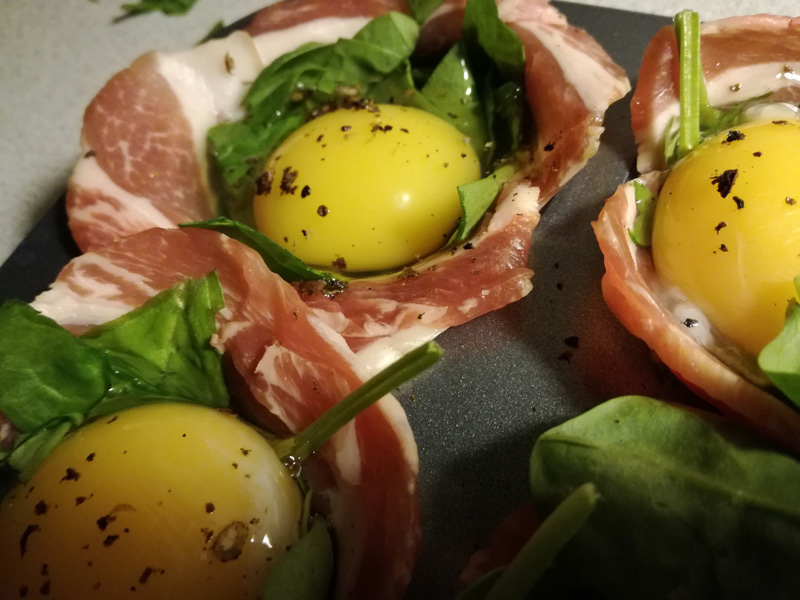 They’re pretty delicious, and very easy to make with just bacon, egg and spinach. Today I am just enjoying the beautiful weather, I have been lounging on the terrace with a book all day. Spring has taken forever to come to Denmark (as usual, this is actually quite normal), so now that it’s here, I’d better enjoy it. I am gonna go pour myself a big glass of white wine and cook up some fish. Enjoy your Sunday.